Garden design, along with lots of other types of design, is all about balance. If a garden feels in proportion with its surroundings and has the right ratio of hard landscaping – paving and hard surfaces – to planting, it will look great and feel “right” within its space. It’s easy enough to follow certain rules about this, but generally it’s an intuitive thing that isn’t always quantifiable in a set of rules. I find the issues to do with balance and proportion are particularly relevant when it comes to designing courtyard gardens. In designing, building and planting a courtyard near me recently, the transformation was so dramatic that I thought it was worth sharing with you. The project is an old rectory belonging to Tom and Jackie, who have been lovingly restoring the property over the past four years. Jackie has some great artistic ideas for the interior and they have a very good builder on site who could do all the hard landscaping work. So they came to me for design ideas and planting suggestions for what was initially a very ugly courtyard on the side of a beautiful house. The courtyard had previously been an outdoor swimming pool which probably dated back to the late 1960s or early 70s. I was given permission to treat the area as a blank canvas, although Tom wasn’t sure he wanted to lose a large conifer at the top end. I was fairly sure it would need to go, but wanted to present them with ideas of why it would need replacing. This courtyard garden is south-facing from the house and so gets very warm, which was why I wanted to keep a water feature as the central focal point. 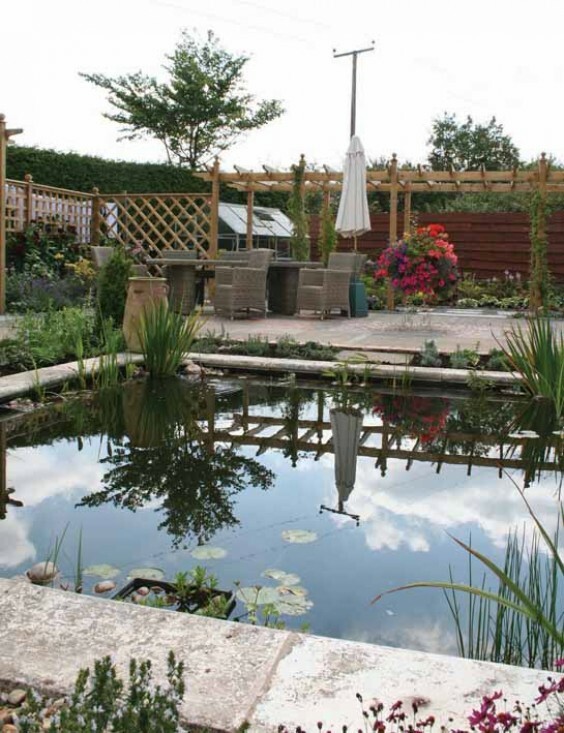 Water has a cooling effect in an area; it attracts wildlife and also has the added benefit of light reflection in a garden. So my design sits around a central pool, with mixed paving at either end – I say mixed because although Tom wanted to re-use the old concrete slabs, they needed mixing in with other materials like bricks and pebbles to give the paving texture and help break up a large surface that would have been very dull with just old slabs. As these old slabs are usually thrown away in favour of new paving, to recycle them like this is not only eco-friendly but looks great too. With the pool at the centre, the design shows the new courtyard squared off with trellis and seating to the left-hand side facing the entrance – this seat is ideal for the late sun as it faces due west – and a walk-through pergola at the top end. The pergola adds depth to the courtyard garden and hides a way through to the old greenhouse in the corner, and also provides a hidden area for the washing line! All important practical things in any garden – it needs to work as well as look fabulous. The added benefit of having the trellis and pergolas is that they gave us lots of opportunity for climbers. We sited scented climbers –roses, jasmine and honeysuckles – near the sitting areas, since with any enclosed, sheltered space such as a courtyard, the scent from plants like this is intensified. The design layout is strong, regular and formal and although this formality is echoed in the clipped box around the pool and at the base of the pergola, the rest of the planting is very soft and flowing. Lavender to edge the paths and plenty of cottage garden perennials enliven the space with colour and texture. Jackie added some large pots, and once the table and chairs were added, you feel you’ve been invited in to enjoy this space. We achieved the full effect of the planting by making sure the borders were well dug over, adding plenty of well rotted compost, and the plants are thriving and look amazing in only a few months. I am yet to source three clipped hornbeams to finish the top end of the courtyard and replace that conifer! But with some drifts of early spring and late autumn bulbs, the design is complete and hopefully Tom and Jackie will have many happy days sitting out in this lovely garden.